There's nothing as comforting as food that your Mum made when you were growing up. I can't really define why that is, but perhaps it is because it reminds you of a much more carefree time when someone else did the hard job of making sure that you were fed, clothed and stayed healthy. Mum often baked for us when we were young to save money - it was cheaper for her to make us treats rather than buy them. Something that often made an appearance in the biscuit tin during my childhood was jam drops, known more commonly as thumbprints in the US. These are shortbread-like biscuits filled with a daub of jam for colour and extra flavour. As a child, Mum often let me help to make the jam drops. My job was to make the thumbprint and fill it with jam. Unfortunately, I often got into trouble for either making the thumbprint too big, or putting too much jam in the thumbprint, or both. Oh well, it was still fun, and I think that I enjoyed "helping" better than eating the finished product back then. I made jam drops for work last Friday. It seems that other people like jam drops too, because even though mine weren't the prettiest biscuits in the world (I think I needed a little more butter), they went like hotcakes. Preheat your oven to 180 degrees Celsius. Grease 2 large cookie trays with butter or spray with cooking oil. Cream the butter and sugar. Beat in the egg, then stir through the vanilla essence. Fold in the sifted flour and salt and mix to form a stiff dough. Roll the dough into balls and place on the cookie sheets, about 2 cm apart. Using your thumb or finger tip, make a hollow in each ball, and fill the hollow with a daub of jam (not too much otherwise it will cook out). Bake the biscuits in the oven until golden (about 15 minutes). Cool the biscuits on the trays. Store in an airtight container. Susan from Food Blogga is hosting an event this month called Beautiful Bones to promote awareness of osteoporosis, in conjunction with the US National Osteoporosis Awareness Month. For this event, Susan has asked us to post about a calcium-rich recipe during the month of May. Being a baker, I chose to make a Blackberry Almond Yoghurt Cake for my entry. The recipe is by Clotilde of Chocolate & Zucchini. I have stayed faithful to the original, except that I used blackberries rather than raspberries, and only used half the amount of berries. I laughed when I re-read Susan's rules about entering, in which she mentions calcium rich foods. I intended to use yoghurt and almonds for their calcium content, but until I checked out Susan's post, I had no idea that blackberries are also calcium rich - so I accidentally used three calcium rich foods in the one cake, simply because I didn't have raspberries but I did have blackberries in the freezer. Preheat your ovent to 180 degrees Celsius. Grease and flour a 9 inch round cake tin (I used an 8 inch square). Combine the yoghurt, oil and sugar in a bowl using a wooden spoon. Beat in the eggs, one at a time. In a separate bowl, combine the flour, baking powder and almonds, then stir into the egg mixture in 3-4 tranches. Pour half of the batter into the prepared cake tin, and top it with half the blackberries, then repeat. Bake in the oven for approximately 50 minutes until cooked through when tested with a skewer. Remove the cake from the oven and cool for 10 minutes in the tin before unmoulding onto a wire rack to cool completely. Serve as is, or with cream or icecream. Enjoy! Thanks to Susan for hosting Beautiful Bones, and I look forward to the roundup of calcium rich recipes. Today is Amy's birthday. Amy is in my team at work, but as she only works two days a week (so that she can look after her lovely daughter), I brought in her birthday cake yesterday. This cake is a white cake with raspberries through it. The recipe is from Rosie Bakes a Peace of Cake for her Shimmering Pink Cake. However, I decorated it using plain glace icing (effectively icing sugar and water), and stuck on some pre-made chocolate shapes that I had piped, and filled them in with jelly for a "stained glass" effect (the colours from which unfortunately leached just a bit into the surrounding glace icing). I also put a few drops of rosewater essence into the icing, which gave it a lovely musk flavour. I didn't dye my cake pink - I thought that the raspberries made it pink enough. Everyone liked this cake, and I was especially glad that the birthday girl herself approved. May's Daring Bakers Challenge is being hosted by the Daring Bakers co-founders, Lis (La Mia Cucina) and Ivonne (Creampuffs in Venice), and co-hosted by Fran of Apples Peaches Pumpkin Pie and Shea of Whiskful. They have chosen a recipe that seemed very challenging indeed - a white chocolate opera cake. Why was this recipe challenging? (a) I have never made an opera cake before; (b) the recipe was quite long and seemed confusing at first; and (c) it uses vast quantities of that notoriously temperamental ingredient, white chocolate. However, I am glad that I bit the bullet and made it, even though I would never have dreamed that I could make this previously, because it tasted DEVINE! I was a bit worried with all that butter, cream and white chocolate that it would be overly sweet, but the combination of the cake constitutents balance each other out so that it is just superb. Definitely not a Weight Watchers cake, but everything in moderation, I always say, and in moderation, this cake is worth every calorie. I left the jaconde the original almond flavour, made a lemon flavoured syrup to soak the jaconde using lemon zest (which I strained out of the syrup before adding it to the cake), a lemon buttercream using lemon zest, a brandy flavoured mousse and the original white chocolate glaze. After the cake had set, I used a bit of reserved buttercream to attach my "chocolate decor" (love that term!) to the cake - hence the little "dots" that you can see in the close-up shot. Despite my initial apprehension, the only hurdles that I met in making this were (a) I originally used Cadbury Dream to make the mousse - it melted into a very odd looking substance, and even though the mousse tasted OK, it took on a grainy, oily appearance, hence I binned it and started again using Plaistowe cooking chocolate; and (b) the white chocolate glaze set almost as soon as I poured it onto the cake, so it is neither very glossy nor smooth. My friend Charet tells me that a hot knife would remedy this; however at the time I was so nervous about mixing the the glaze with the mousse while trying to spread it, I wasn't keen to play with it too much. I loved the buttercream in this cake - it is easily the best tasting buttercream that I have ever had, with no greasy mouthfeel that I generally associate with buttercream. Although the recipe was rather involved, calling for a candy thermometer to "cook" one stage of the buttercream to a particular temperature, I had not problems with achieving a satisfactory result. I served this cake for dessert when I had Charet and Marco over for lunch. I had plenty left over, which I took to work for morning tea and to my friend Veronica's for dinner, as leaving me alone with a cake like this is way too much temptation for me. They loved it, some saying it was my best cake yet. If you would like to make your very own opera cake for a special occasion, you can find the recipe at one of the hosts' sites. This month, the Daring Bakers are invited to dedicate their posts to Barbara of Winos and Foodies, a former Daring Baker, host of a Taste of Yellow, a LiveSTRONG blogging event. Barb is a wonderful, strong lady who has shown bravery and character in the face of life's challenges, and to whom all Daring Bakers can aspire. 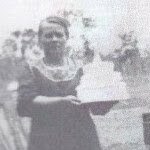 Barb, this cake is for you - it is full of lemon with a distinctive upbeat yellow vibe that I hope you'll love. Jumble bumbles - Laws of the Kitchen Turns One! Today is the first birthday of Laws of the Kitchen - my how time flies when you are having fun. I can't believe that I have now been keeping this blog for a year - especially as it took me two years to actually getting around to doing it. It has definitely been a fun blogging year! I have a record of many of the things that I have made over the last 12 months, together with miscellaneous ramblings that remind me of certain things. I have also met a bunch of like-minded people who have food blogs and from whom I have learned all sorts of things. Not only have I learned new recipes and cooking techniques, but I have learned about other cultures, lashings of history and some new vocabulary, and had some insight into the lives of some very talented people all around the world. How cool is that?? To celebrate the first birthday of Laws of the Kitchen, I have made spiced biscuits called Jumble Bumbles from The Australian Women's Weekly Cookies book. As well as the letters and numbers photographed above, I used the remaining dough to make biscuits in the shape of scottie dogs, Australia, butterflies, hearts, stars and tulips. They were rather fiddly to make, but the end result is very cute. Sift the dry ingredients into a bowl and set aside.Place the butter, sugar and egg in the bowl of an electric mixer and beat until well combined. Remove the bowl from the mixer and stir in the golden syrup, then add the dry ingredients in two batches, stirring to combine and form a soft dough. Turn the dough out onto a floured surface and knead. Place the kneaded dough between two sheets of baking paper and roll out until it is 5mm thick, then place in the refrigerator for half an hour. Preheat your oven to 150 degrees Celsius, and line and grease cookie sheets. Remove the chilled dough from the refrigerator, and cut dough into desired shapes using cookie cutters. Place the cookies into the prepared cookie sheets, and bake for about 15 minutes until just turning brown around the edges. Cool the cookies on the cookie sheets. To decorate the cookies, make a royal icing by combining one lightly beaten egg white, 1 1/2 cups sifted icing sugar, 2 teaspoons plain flour and enough lemon juice to make a thick icing. Tint the icing whatever colour you fancy, then ice the cookies, sprinkling with lollies if desired. Enjoy! On the cover of the March edition of the BBC's Good Food magazine, there is a photograph of an amazing looking, hearty winter dish, which I learned was a herby lamb cobbler. I bought the magazine on the strength of that photo, and set out to make the cover dish. I was a bit shocked to read that the original dish contained 963 calories and 60g of fat per serving, so I modified it by substituting the butter rich "biscuit" top for reduced fat puff pastry - making mine a pie rather than a cobbler. I also used pork neck instead of lamb neck, because I bought a huge piece of it from the Queen Vic Market on spec. Hence, instead of a herby lamb cobbler, I ended up with a slow cooked pork pie! I have to say that the meat filling of this dish is just devine - the filling is not thick, but it is rich and flavourful. I would definitely make this again, with or without the top. In a large frypan, heat the oil and fry the bacon until crips. Add the pork and cook until brown. Remove the meat from the pan, then add the onions, carrots and mushrooms to the same pan with the meat juices in the bottom. Cook the vegetables over high heat until they strat to brown, then add the flour. Return the meat to the pan, add the bay leaves and thyme, and pour in the wine, stock and a generous splash of Worcestershire sauce. Season with salt and pepper to taste, then place the mixture in a casserole dish in the oven and cook for one hour and and twenty minutes. Once this time has expired, remove the casserole dish from the oven and top the meat with puff pastry, pushing it firmly onto the top of the meat. Brush the puff pastry with a beaten egg, then return the pie to the oven for a further 45 minutes until the top is golden brown. Remove the pie from the oven, stand for around 10 minutes to allow the sauce to thicken, then serve. This pie is perfect for a cold winter's night (of which we have already experienced a few! ), as it is rich and warming. The amazing Helene of Tartlette is hosting Sugar High Friday (founded by Jen, The Domestic Goddess) this month, and she has chosen a citrus theme. Hooray!!! I am a citrus lover, and I particularly love those astringent beauties, lemons and limes. You have until 25 May to participate, and all that you have to do is make a dessert featuring citrus. Helene herself has posted several citrus desserts since announcing this month's theme, demonstrating that with flavours this good, the hard part is knowing exactly what to choose. After much deliberation, I decided to make a most wonderful looking marzipan and lemon cake from May's Delicious magazine, with the recipe by Aussie cook Belinda Jeffery. You cannot really taste the marzipan in the finished cake, so all haters of marzipan icing can breathe a sigh of relief. The cake is surprisingly delicate, sweet and light given the amount of butter in it, and it is very difficult to stop at just one slice. The flaked almonds on top give the cake a wonderful crunchy texture which complements the lemony cake beneath. Best of all, this cake is quick and easy peasy to make, because Belinda's directions use a food processor. Preheat your oven to 170 degrees Celsius. Line and butter a 23cm springform pan, and dust the inside of the pan with a light coating of plain flour. Sift the flour, baking powder and salt in a food processor, pulse briefly until combined, then place into a bowl and reserve. Put the sugar and marzipan in the food processor and pulse until they form crumbs. Next, pulse the eggs through the mixture in the food processor, one at a time, and once all the eggs are in, pulse for a minute to combine well. Add the butter and pulse until the mixture is thick and the butter is well combined. Add the zest and essences to the batter and pulse briefly. Finally, add the dry ingredients reserved earlier, and pulse until just combined. Pour the battter into the prepared pan, and sprinkle the top of the cake with the flaked almonds. Bake the cake for about an hour until done when tested with a skewer. Remove the baked cake from the oven, cool it in the tin for 10 minutes, then release the sides of the springform pan, invert the cake almond side down onto a flat plate, then use the plate to put the cake right side up onto a wire rack to cool completely. Belinda suggests dusting the cake with icing sugar and serving with cream, but I served it as is, and it was delicious! Thanks to Helene for hosting SHF this month. If you want to be transported to citrus heaven, check out the other 129 entries in this month's SHF here and here. I made another citrus cake, this time a marmalade cake by Nigel Slater that I saw on Margaret's Kitchen Delights. Margaret's cake turned out way better than mine. Sure, mine tasted OK, but what you can't see in this glamour photo of my cake is that it sunk terribly in the middle. The recipe warns that it will sink slightly, but mine developed the most enormous dimple right down the middle - perhaps it was laughing at me! The cake tastes fine, but it is definitely not one that I could serve to company because of its imperfection. Maybe I'll try it again to see if I can keep the tart yet sweet marmalade flavour while eliminating the dimple. Yesterday morning, I received a wonderful surprise. I went to the post office to collect a parcel for which I had received a calling card, expecting it to be something that I had ordered online. However, to my great surprise and pleasure, it was a parcel all the way from California from Diane and Todd, the fantastic White on Rice Couple. If you haven't yet found Diane and Todd's site, I highly recommend a visit - their beautiful photography, fun and educational videos and interesting and original dishes, often with an Asian influence and utilising their own fresh produce, will blow you away. Vietnamese shrimp crackers to make Asian nachos - yum! I am a self-confessed chocoholic, so I am in chocolate heaven at the moment. Thanks so much Diane and Todd! This is an amazing parcel and a wonderful surprise (and the guys at work had almost as much fun as me in opening it). You have made my week! I often do brunch on Sunday mornings with my friend Veronica. We live fairly close to each other, so there are a number of local cafes that are our favourite regular spots for brunch. It's a great, relaxing way to spend a Sunday morning, chatting over food and coffee, and catching up on each other's weeks. Last Sunday, I offered to cook brekky and bring it to V's house, and V accepted. The menu planning was easy - a couple of weeks ago, we had great Spanish eggs at Kanteen, on the banks of the Yarra River at South Yarra. Neither of us had tried Spanish eggs before, and we were initially surprised by them when they arrived. However, the surprise was soon overtaken by that "oohhh, good" feeling - they were delicious! We also saw (but did not order) some fabulous looking Spanish eggs at Richmond Hill Cafe & Larder the very next weekend. Accordingly, my fate was sealed - I had to make my own Spanish eggs. Preheat your oven to 170 degrees Celsius. Spray 2 ramekins with cooking oil and place them on a baking tray. Heat oil in a frying pan, and cook the chorizo sausage until the fat just starts to run from the chorizo. Add the capsicum to the pan and cut the chorizo up into pieces and cook until the capsicum is soft and the chorizo has browned. Pour the tomatoes into the pan and continue to cook the mixture until the tomatoes are heated through. Divide the sausage mixture evenly between the two prepared ramekins. Crack an egg into each ramekin on top of the sausage mixture, and drizzle each with a tablespoon of cream. Season with salt and pepper, and put half the cheese on top of each egg, and sprinkle each with a pinch of paprika. Bake the eggs for 15 minutes or until the egg is cooked and the cheese is golden. Pancakes are not my forte, but I had another shot, and these tasted OK. I used this recipe from Nami-Nami. I felt very Nigella-esque walking down the street with my pans of food wrapped tightly in foil and tea towels - it reminded me of an episode of Nigella Feasts where she and the children walk to a friend's house with dinner. This was a fun Sunday morning diversion, especially as my idea of breakfast at home is usually two Weetbix with milk. I highly recommend trying it some time if you have the luxury of time to do so, and your friends will love you for it! Thanks Swati! You make my day too. For those who haven't yet seen Swati's gorgeous sugarcraft creations, do check out her site - you will be in awe! Whether it be your great recipes, your entertaining writing, your courageous stories or just the fact that you post about something that tickles my fancy, you guys make my day! Best wishes to you all. 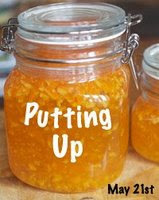 Pixie of You Say Tomahto, I Say Tomayto, and Rosie of Rosie Bakes a Peace of Cake, are hosting an event called Putting Up, which apparently is a reference to "putting up" preserves. Pixie chose this event topic because she had not yet made her own jam or preserve when she announced the event on 6 April. She has since then gone on to make several fine types of preserve. I have made lemon curd before with no worries, but jam is something that has always troubled me. Although I had never tried it, the whole process of cooking fruit and sugar without ending up with a burned, super-glued mess, and sterilising jars without burning myself or exploding the jars, left me in a cold sweat. However, as I am a Daring Baker, I am supposed to be fearless in the kitchen, so this event has squarely laid down the gauntlet for me to step up to the plate and make preserves. Originally, I had wanted to make rhubarb jam (in honour of my friend Ivy) or quince jam (because I recently had a jar of the most gorgeous quince jelly made by a work colleague, Julien). However, when I went to the market with my friends Charet and Marco to buy the fruit, I couldn't see any quinces or rhubarb - but beckoning me was a huge sign saying "Plums - $1.00/kg". Brilliant - I love plum jam and didn't have any at home, and I figured if it all ended in tears, I would not have wasted a fortune on expensive fruit. Accordingly, I shovelled a kilo and a half of plums into a bag and took them home. When it came time to make the jam, I felt rather nervous. I had never done this before, and hence had no real idea what I was doing, despite reading Pixie's interview with Rosie, an article in the March edition of Cuisine on sterilising and sealing jars, possessing Amy Schauer's book on preserving (which assumes that I know way too much), and having carefully read the instructions on my packet of Jamsetta, which is a powder made by Fowlers Vacola in Australia that presumably contains gelatine or pectin to give your jam a nudge in the right direction. However, armed with all the information that I could hope to obtain without having my Mum on hand to guide me, I dived in to make my very first batch of jam. Cut the plums in half and remove the stone. You don't need to peel them. Place the halved plums and the water into a large saucepan (your final jam should not take up more than 1/3 of the volume of your saucepan) and cook over a gentle heat for about half an hour until your fruit is a soft pulp, stirring from time to time to ensure that the fruit doesn't burn onto the pan. Warm the sugar by placing in a heat-proof bowl in the oven at 150 degrees Celsius for about 5 minutes. Add the warmed sugar and the Jamsetta to the fruit while still on the heat, and heat gently, stirring until the sugar has dissolved, then turn up the heat and bring the mixture to the boil. Boil the jam vigorously for about 10 minutes, then put a teaspoonful onto a cold plate and let it sit for 30 seconds. After the 30 seconds has expired, run your finger through the jam on the plate, and if it crinkles, the jam is cooked. If it doesn't, boil for another 5 minutes and try again. Once the jam is ready, take it off the heat and let it sit for 5-10 minutes, before pouring into hot, sterilised jars. Clean the rim and sides of each jar with a damp cloth, then seal each jar. To sterilise the jars, boil them for 10 minutes, then remove them from the water using tongs, and dry completely. You can microwave the boiled jars to ensure that all moisture is removed, but don't microwave metal lids (basic, but I did it!!). To seal the tops of the jars, use squares of cellophane cut to size, moisten them and place them over the top of the hot jar and secure with a rubber band. The cellophane will shrink to fit the jar. Place the jar lid over the top of the cellophane seal. As I type this post, my plum jam is still cooling in the jars, but I tasted the jam on the spoons, the saucepan, the spoon rest etc and it tastes soooooo good. If I ever end up with a lot of fruit that I don't know what to do with, or I want to preserve the goodness of one season for another, I would definitely try making jam again with other fruits. Thanks to Pixie and Rosie for tempting me outside of my comfort zone to try the great home art of jam making. 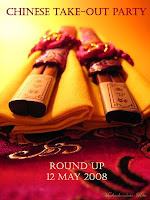 You will be able to see lots of other great preserves by visting the roundup at Pixie's and Rosie's sites after 21 May. Thanks to all of you and to everyone else who drops by to say hi - I genuinely appreciate it. When I saw that this month's Waiter There's Something In My ..., hosted by Andrew of Spittoon Extra, had a theme of dried fruit and nuts, I was in straight away. I love fruit and nuts of all varieties, and when I have the chance to put them into baked goods, the hardest part is choosing what to make! It is Simon's birthday on Saturday, so my WTSIM entry is also Simon's birthday cake. My choice was Dorie Greenspan's Double Apple Bundt Cake from Baking - From My Home to Yours. This cake is loaded with fruit (both fresh and dried) and nuts - it contains grated apple, apple sauce (which I used instead of apple butter), pistachios (which I used instead of walnuts or pecans) and raisins. It also has lemon icing. All of the fruit makes it a very moist, scrumptious cake. I got to try it by virtue of making a baby cake for myself, as I will be out of town tomorrow when the cake is served. It also smells heavenly while it is cooking and fresh out of the oven due to the warm apples. I was actully sad that I will only get my one muffin-sized piece! This cake is not difficult to make, but it is a little time intensive because of the requirement to chop the nuts and peel, core and grate the apples. It also takes the best part of an hour to bake. However, I was easily able to make it from start to finish (including icing) in an evening. Preheat your oven to 180 degrees Celsius. Grease a bundt pan and set aside. Sift the dry ingredients togethr in a bowl and set aside. Cream the butter and sugar, then beat in the eggs , one at a time. With your mixer on low speed, add the apple butter, then the grated apple, and finally add the dry ingredients, and beat until just combined. Remove the bowl from the mixer and stir through the nuts and raising by hand. Pour the batter into the prepared bundt pan, and bake in the preheated oven for 50-55 minutes. Cool the cake in the tin for about 5 minutes before turning onto a wire rack to cool completely. Once the cake is completely cool, ice with a lemon glaze made from icing sugar and a little lemon juice. Enjoy! Thanks to Andrew for hosting WTSIM again this month, and I look forward to the fruit 'n' nut roundup, especially with winter coming on. I am on a roll with baked goods with lemon icing - but you can never get enough of a good thing! This time, I made Smitten Kitten's blondies , which I spied first at Jessy and Her Dog Winnie. I didn't mess with the recipe - I wanted to try the original first. I topped these chewy, luscious treats with lemon icing and coconut, which in my mind was perfection. These are another great idea for morning or afternoon tea - or just for the heck of it! Next time, I think fruit and nuts would be great in these - I'd absolutely make them again. Best of all, they were a cinch to make and can be made quickly with store cupboard ingredients. Perfect! Bill Granger is one of my favourite chefs. Unfortunately, I don't have pay TV, so I can't see his show. However, I adore Bill's books, of which I now own three. His style of cooking is generally light and flavoursome, with a distinct Asian influence in many of his dishes. Bill's latest book is Holiday. His recipes are divided into dishes suitable for a number of different holiday seasons. I chose to make Bill's ginger biscuits with lemon icing for work, which is aptly taken from the Harvest chapter of Holiday, as it is autumn in the Antipodes. These little biscuits are gingery shortbread-style biscuits studded with crystallised ginger as well as containing ground ginger, and are complemented by a lemon icing. The recipe doesn't make a very big batch, so if you are feeding a crowd, I recommend doubling the recipe. These biscuits taste very pleasant, and are relatively small and light, so you can have a couple of these with your morning coffee without spoiling your appetite. Sift the dry ingredients together into a mixing bowl, and stir through the crystallised ginger. pour in the butter and vanilla and mix into a dough. Place tablespoons of dough on baking trays lined with baking paper, and flatten the biscuits lightly with a fork. Place them in the preheated oven and bake for approximately 15 minutes, then cool the biscuits on a wire rack. To ice the cooled biscuits, mix one cup of icing sugar with enough lemon juice to make an icing of piping or drizzling consistency. Pipe or drizzle the icing onto the biscuits. Enjoy with your morning coffee. 1. Pick five blogs that you consider deserve this award for their creativity, design, interesting material, and also contribute to the blogging community, no matter what language. 3. Each award winner has to show the award and put the name and the link to the blog that has given her or him the award. 4. Award-winner and the one who has given the award have to show the link of Arte y Pico blog, so everyone will know the origin of this award. 5. Award winner must show these rules. These are fantastic blogs - do drop by to visit them! I attended the last night of my cake decorating course at William Angliss on Tuesday. To finish out the course, we made ready to roll fondant plaques, and decorated them with chocolate and jelly. The chocolate was both easier and harder than icing to decorate with - easier because it flows more quickly, and harder because it has a nasty tendency to harden in the piping bag tip before you are finished, and if you cut your piping bag tip too large, it flows all over the place. I loved the jelly overlay, because it was bright, colourful and reminded me of stained glass. I used my new piping skills to pipe whipped cream in and around the cake. The chocolate cake itself was the recipe from the Crabapple Bakery Cupcake Cookbook that I have made before, just filled and decorated differently. Kane was very happy with his cake, as he had never had a birthday cake at work before. The feedback was that it tasted good (relief!). I am flying home to see my Mum for Mothers Day and taking Monday off so that I don't have to hurry back. I will probably make Mum a plain madeira cake (she doesn't like "goopy" cakes) and stick the plaque on it with very small icing rosettes. more special (provided that I am not too lazy!!). Thanks to Greg Williams, our teacher, for passing on some of his skills to us, and for his patience with our often none-too-tidy work habits. On 1 May, Mochachocolata Rita posted her 88th post. Number 88 is lucky in Chinese culture, so to celebrate this milestone, Rita is hosting a Chinese take-out party. To come along, it's simple - make a Chinese take-out dish and post about it by 12 May. I wanted to make chicken chow mein, so after some Googling, I found this recipe on Taste.com.au. It is a little different to traditional Aussie chicken chow mein in a number of respects. First, it isn't a pale, ghostly grey colour. Second, it is not as glutinous as your typical chicken chow mein take-out. And finally, it contains egg noodles, which are not typically found in "Aussie" chicken chow mein. However, for all of these reasons, it tastes so much better than take-away chicken chow mein. Sure, I love Chinese take-out, even with the pale, gluggy chicken chow mein that is bog standard in Australian Chinese restaurants, but as a regular meal, I much prefer this version. It is very tasty and sounds and looks very healthy. Also, it is perfect if you want to be a "lazy bones", because it uses a bought barbecue-cooked chicken, and frozen pre-cut veges work OK. Thanks to Rita for hosting this event - congratulations on your 88th post! Do check Rita's site for more Chinese take-out ideas here. I have read a lot of good things about Sherry Yard's latest book, Desserts by the Yard. Among other things, Sherry has been a pastry chef at Spagos in Beverley Hills. Accordingly, when I was ordering Sticky Chewy Messy Gooey, I also ordered Desserts by the Yard. Desserts by the Yard is a beautiful book, and is divided into recipes by the stage in Sherry's career when she learned how to make the various dishes. She has worked in a number of different countries, so a number of different cultural influences shine through in her recipes. Some of Sherry's recipes are way too extravagant for me to ever consider making (for example, her chocolate Oscars creations); however, many of them sound delicious and are things that you could make at home. One of the "home-ier" recipes is for President Clinton's Oatmeal Cookies. It isn't Bill Clinton's recipe; rather, it is a type of cookie that Sherry made for the then US President that he liked very much. And what is not to like about these cookies? They are chewy, sweet and pleasantly oaty. They also contain alcohol-soaked dried fruit, which I think makes them. Sherry has helpfully provided the recipe for these cookies here on her website. However, if you are a dessert fan, or just love looking at pictures of well constructed, delicious desserts, then Desserts by the Yard may be the book for you. Instead of using fat raisins (because I didn't have the ingredients to make them), I poached one and a half cups of sultanas in a quarter of a cup of rum until the fruit had absorbed the rum. Everyone at work liked these cookies, so I don't think that this substitution detracted from the end result. I baked them straight away rather than creating logs with the dough and freezing them, and it worked just fine. If you like home-style oatmeal cookies with a twist, this is a great recipe to try. This month, Meeta from What's for Lunch Honey has nominated the theme of Bollywood Cooking for the Monthly Mingle. As the name suggests, Meeta is looking for glamorous Indian cuisine fit for a red carpet. For my entry, I decided to make Date and Coconut Burfi (fudge), which is a festival food in India. The very word "festival" evokes Bollywood glamour to me, so I thought that this would be perfect! Butter a long, flat slice tray or plate and set aside. Put the condensed milk, coconut, dates and sugar in a heavy-based pan, and cook over a medium heat until it becomes thick and fudgy in consistency. Add the chopped butter or ghee, and cook until the butter just begins to separate from the fudge. Stir through the cardamom, then remove the pan from the heat and pour the mixture into the prepared tray or plate, spreading with a metal spatula until it covers the tray or plate and is relatively smooth on top. Sprinkle the top of the burfi liberally with flaked almonds, and allow it to cool slightly. While the burfi is still warm, cut it into squares, and press a silver cachous into the centre of each square (for added "bling"! ), but leave them in the tray or plate to cool completely. Once cooled and set, remove the burfi from the tray or plate and serve. Delicious! Thanks to Meeta for hosting this month's Monthly Mingle, and be sure to check her site here for the roundup, and the winner of a copy of The Bollywood Cookbook by Bulbul Mankani. Inspired by the wonderful cheesecake pops from last month's Daring Bakers Challenge, I bought Jill O'Connor's book, Sticky Chewy Messy Gooey. It is such a cute book, and I think that Deborah and Elle picked one of the best recipes out of it for DBs. I needed to make something for morning tea last Friday which only used ingredients that I had around the house. Flipping through Sticky Chewy Messy Gooey, I found a recipe for Mountain Meadow Chocolate Fudge Cake that sounded really good, and for which I thought I had all the ingredients. Alas, I was short one egg, and had to run to the service station for eggs in the middle of the process on a rather chilly evening. However, it all turned out in the wash, as I think my photos attest. This cake is a massive chocolate hit - the icing in particular is very thick, rich and fudgy. The team loved it! Rather than re-invent the wheel, you can find the recipe on Pittsburgh Needs Eated here, should you want to try it out. Or even better, invest in Jill's book - you won't be sorry. The only change that I made was to leave the pecans out of the icing, and to sprinkle the top of the icing with flaked almonds instead. If you love your chocolate full on, this cake is for you! On a different note, the wonderful effervescent Pixie from You Say Tomahto, I Say Tomayto has awarded me the Yummy Blog Award. Thanks so much Pixie!! Todd & Diane, the very groovy White on Rice Couple, who inspire me with their videos and creative dishes using produce from their fantastic garden. If you haven't visited these sites before, they are well worth the trip - you'll love them. For the past 4 Tuesday evenings, I have been attending a cake decorating class at the William Angliss Institute of TAFE in La Trobe Street, Melbourne. Our teacher, Greg Williams, has so far taken us through icing a fruit cake, making sugar flowers, creating a floral spray for a cake using sugar flowers and leaves and ribbon bows, and decorating with buttercream frosting. The results of my labours are pictured below. My buttercream piping effort was not the greatest because I didn't want to fuss around with umpteen dozen colours of icing or go for an elaborate but ugly design. However, despite its obvious flaws, I like its simplicity, and now that I have learnt the techniques, I can practice and improve in my own time. I was disappointed because I went to a restaurant straight after class with my completed cakes, and the staff knocked over the buttercream iced cake twice, accounting for the smooshed piping around the edges in two places. Oh well - it still tasted the same, and I inflicted it on my work colleagues the next day. There is one week of class left, where I believe that we are going to learn how to decorate a cake using chocolate and jelly. I am looking forward to it!